"A must-have for all musicians and teachers"
The world of music scales and modes just got more interesting! 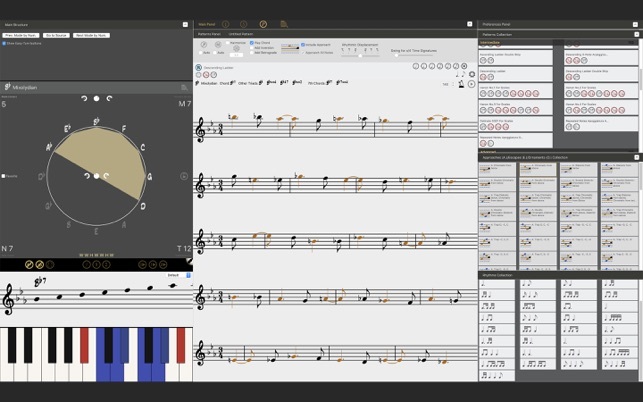 Tessitura Pro is a powerful tool for students, jazz players, arrangers and composers. Study scales, modes and melodic patterns like never before. Tessitura may be used with any instrument. It includes standard music notation, w/transposition for any transposing instrument, piano keyboard panel, guitar fretboard and guitar tabs. This app is ideal for Jazz improvisation and composition. Play and write modern lines that no other player has ever used before. Take your music skills to the next level. 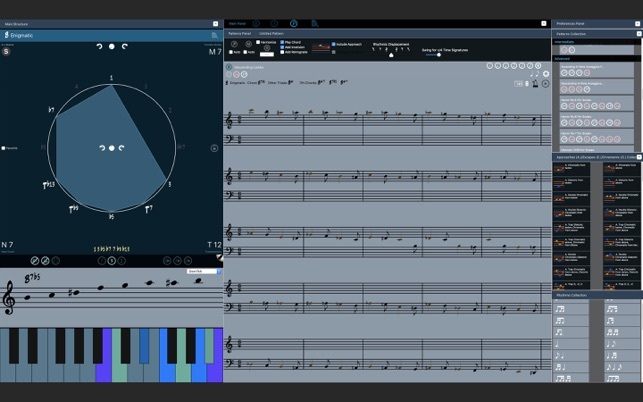 From the creators of Mapping Tonal Harmony Pro comes another great tool for the music student and teacher. 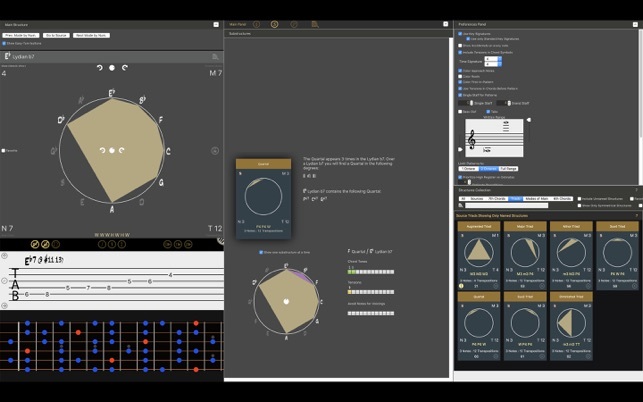 Tessitura Pro offers infinite practice patterns for any scale, chord, or any other kind of music structure you can imagine. All the structures in music are here. Investigate new scales and modes and how they all related to each other. Create Melodic Patterns using step-skip patterns with approaches and escape tones for improvisation and composition. The combinations are infinite. Practice and study over the 12 keys using different modulation schemes or over all the modes of a scale. An endless source of materials to study and practice. Learn music structures from a new perspective. Understand the relationship between modes in structures over the circle of fifths or the circle of fourths. 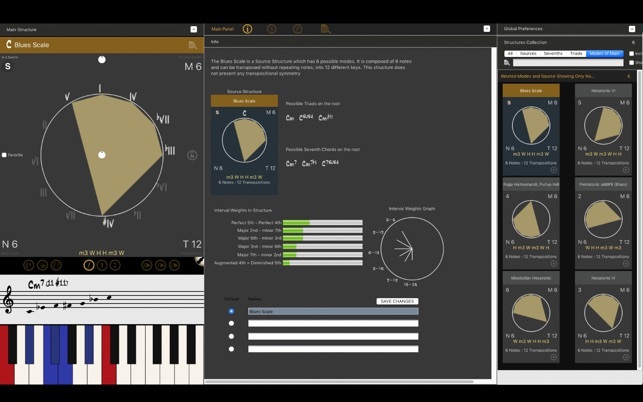 Tessitura pro includes ALL scales and modes. 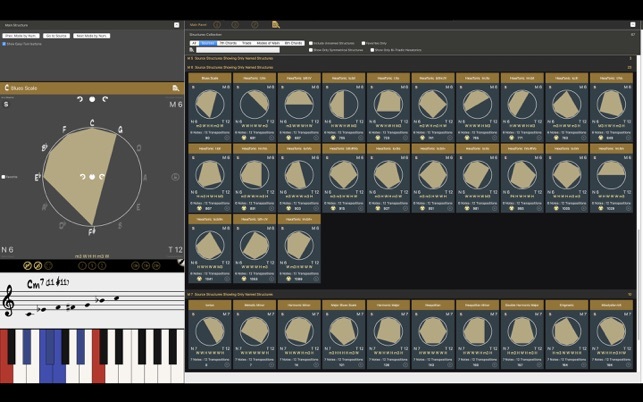 Tessitura Pro also analyzes the intervalic weight on any structure, which is a great tool for composition and improvisation. Das Konzept finde ich äußerst Interessant, doch wären Instruktionen und das Interface noch auszubauen! Ich bin auf Updates gespannt! Die App hat viel zu viele Fehler. Hier nur zwei als Beispiel, die mir bei den ersten Versuchen aufgefallen sind. Das Preferences Panel lässt sich nicht verbergen. Wenn man die Pfeiltaste nach Unten drückt, stürzt das Programm reproduzierbar ab. Eigentlich eine spannende App, im jetzigen Zustand allerdings nicht wirklich nutzbar. Vielen Dank für Ihr Feedback. Wir haben die Bugs behoben, die du in der nächsten Version 2.3.1 erwähnt hast (wartet auf die Überprüfung im Moment) .Bug fixiert (Down-Taste verursachte die App zum Absturz). Sie können nun das Präferenzen-Panel ausblenden, wenn keine anderen Panels auf der rechten Seite benötigt werden. Bitte senden Sie uns mehr Feedback, damit wir Tessitura Pro verbessern können.